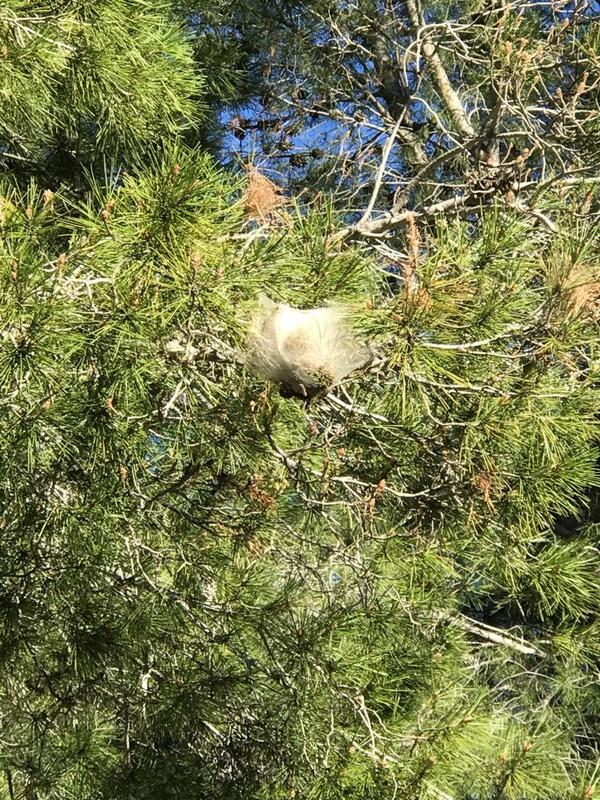 The pine processionary caterpillar is a dangerous pest to both humans and their pets in southern Europe. The hairs on their backs can cause severe irritation and allergic reactions. This is especially dangerous for dogs (like ours) who like to forage as they could easily ingest one or even just get a single hair in their mouth. We have heard many awful stories of dogs dying as a result or, even if they survive, needing to have parts of their tongue and face amputated. We’ve also heard that some small children have died after coming into contact with them. 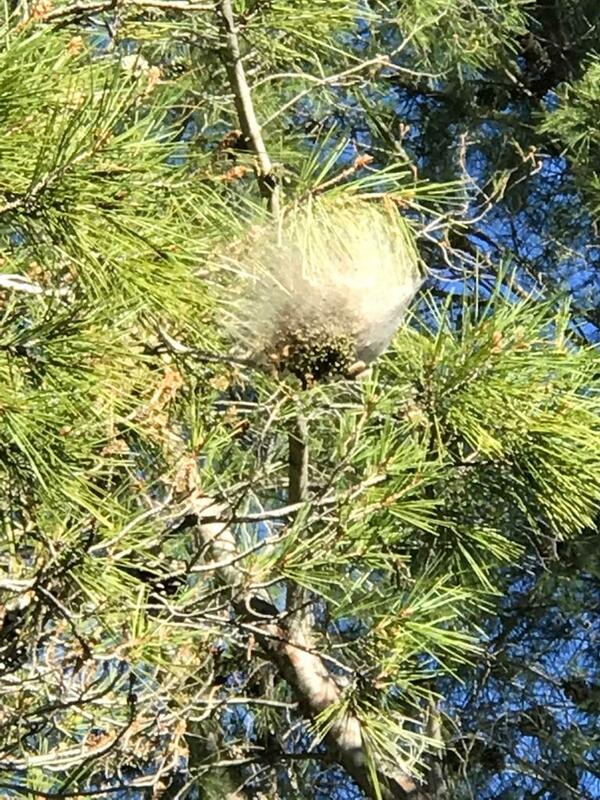 During winter the moth larvae grow inside nests in the branches of pine trees, nests which look a little like large white cotton balls/spiders webs. Depending on the area and the temperature, in late winter/early spring they start to come down from their nests to feed and, eventually by mid-April, burrow into the ground in preparation for transforming into moths themselves. The nests are incredibly common in Spain and are spreading gradually northwards as a result of increasing temperatures. 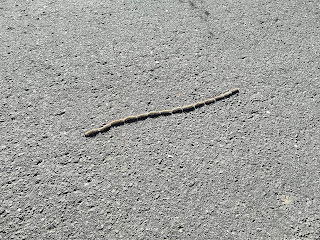 Some people we know won’t even travel in Spain at this time of year because of the caterpillars. 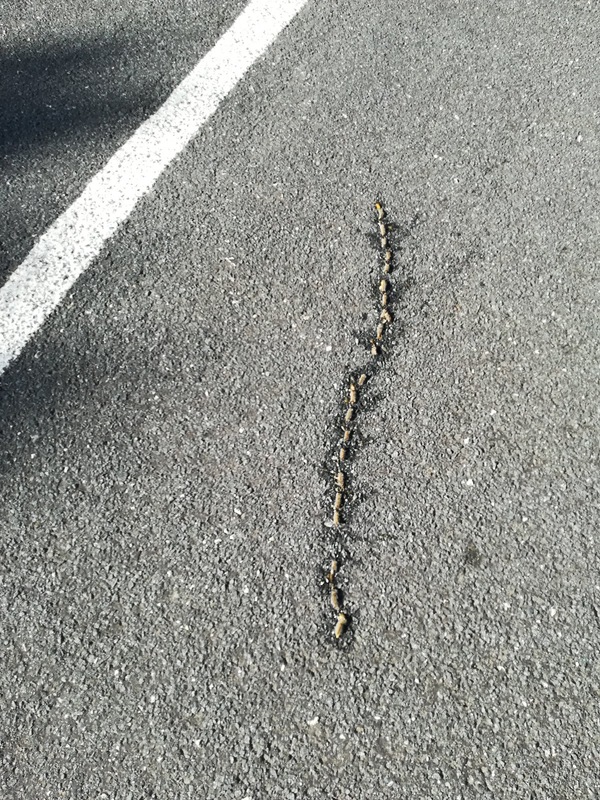 Because you don’t know where a caterpillar has been, in theory, anywhere could be a possible risk area. 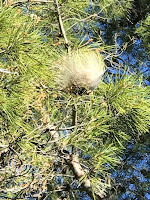 As it is the hairs that cause the problem, and it is possible for the caterpillar to eject the hairs if threatened, a dog might just tread on one, get irritation and then lick their paw. We’ve been told this is the most common way a dog comes into contact with the hairs. 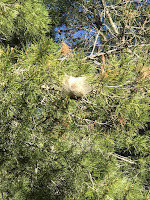 However, there are also many people who do travel or that that live around the nest/pine forests year round. 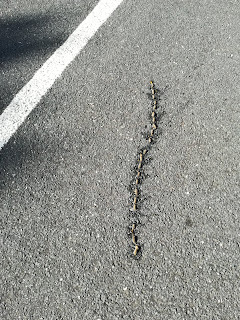 It’s about managing the risks and being aware, especially in piles of pine needles which is where the caterpillars feed. 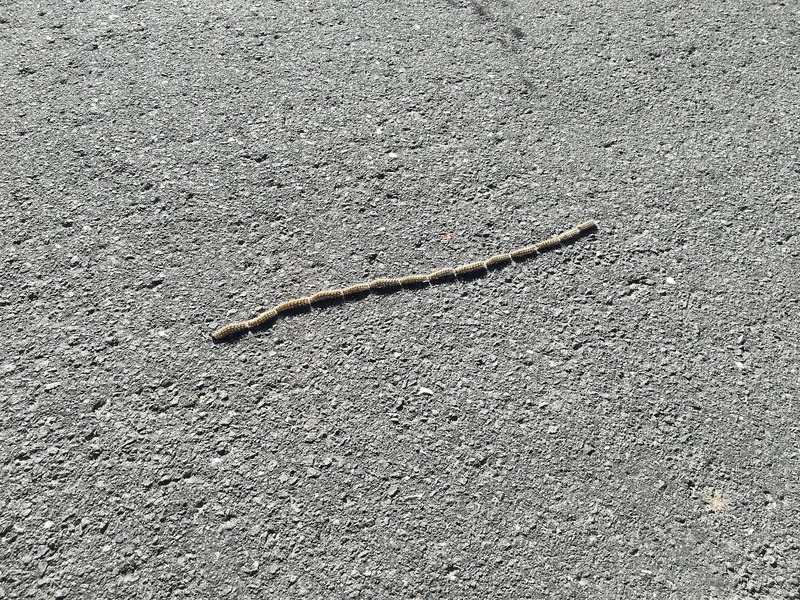 We are currently in Xalo, close to Benidorm, and today saw our first live caterpillars crawling on the road. As you can see in the picture at top of this post, they move in a line, hence the name ‘processionary’. Again, we’ve always been told to be cautious from late-January through to the end of April, but this changes all the time based on area and temperature etc. so ask around in the area you’re visiting. 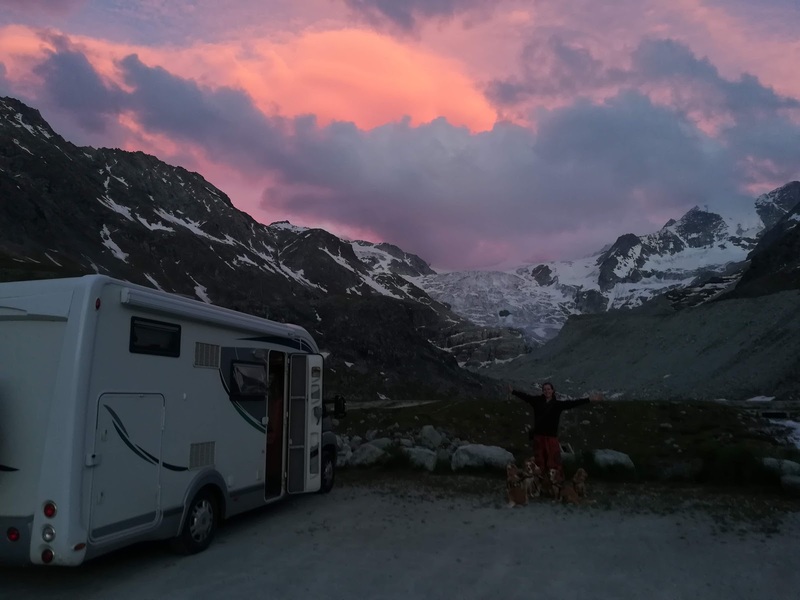 The reason for this post is that, although many know about them, we still regularly meet travelling with pets and small children who have never heard of them. Even now I still find it hard to believe that there is an actual dangerous pest in Europe! p.s. 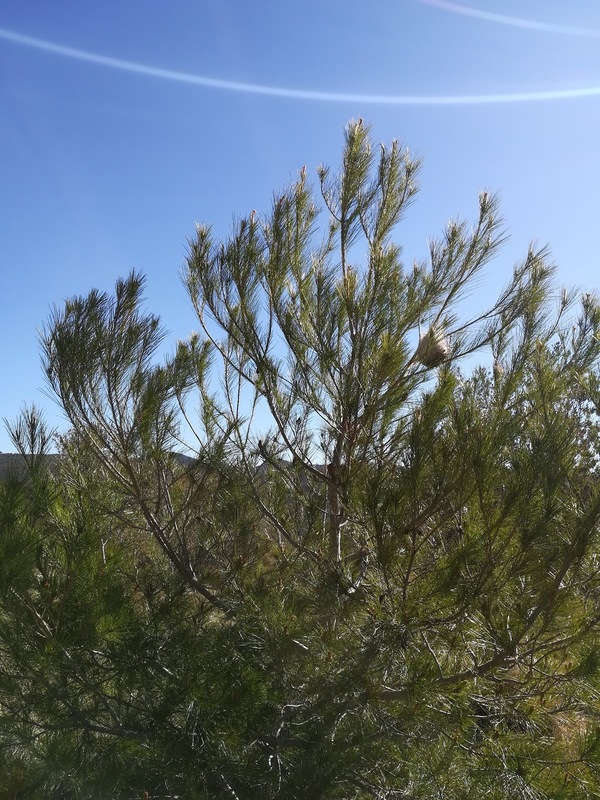 we might write about other pests / pet risks we watch out for in future, but wanted to mention here that recent news articles and Facebook posts in the Costa Brava area are warning about poisoning incidents for dogs. What we can understand is that it is rat poison around dustbins, although some people have also implied some deliberate poisoning taking place as well. So be careful what your dog eats on the street. It’s a big concern for ours as they love to eat anything they come across.